Until recently most medical theory was based on the assumption that the 20% of our body that is solid tissue is what determined our health, since that is where most outward signs of disease and illness are found. It was thought that the 80% of our body that is liquid merely supported the structure of bone and organ tissue. We now know the opposite to be true, the fluids that flow through our body are what create our level of well being. The human body is a water machine, designed to run primarily on water and minerals. By weight our body is about 72% water, another 8% is a combination of chemical compounds and the remaining 20% is bone and solid tissue. From the most basic standpoint it is a common sense equation, if we are made up of 72% plain water, then naturally the quality of the water we consume will have a very dramatic impact on our overall state of health. Every healing and life giving process that happens in our body happens through Water! 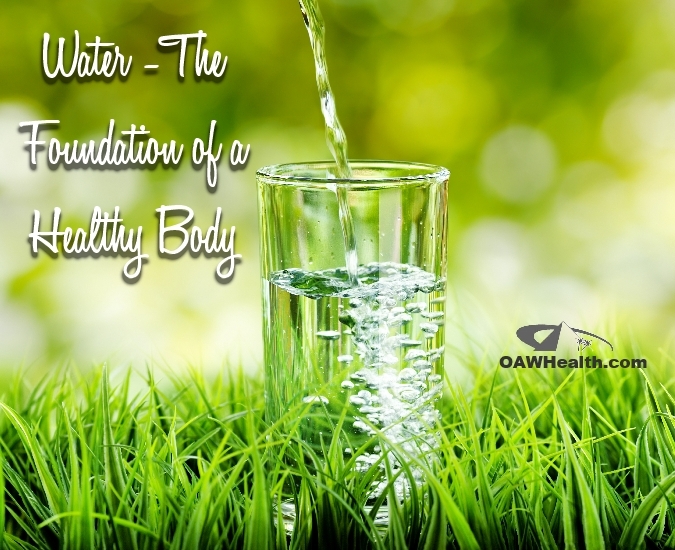 In just the last decade medical science has begun to focus on the tremendous healing ability our body has and how much that ability depends on water. Our body instinctively strives to be young and healthy. Each component working in amazing synchronicity to bond broken bones, regenerate and replace damaged tissue and attack and destroy hostile organisms. In each of these miraculous processes there is one common factor…WATER! Our brain is over 80% water and controls each and every process that happens inside of our body. This control is maintained by constantly sending and receiving electrical signals through our nervous system, which in reality is nothing more than an elaborate system of tiny water ways. The fluid inside our nerves is made up almost completely of water and minerals. Tiny messengers called transporter proteins travel at the speed of light carrying these life giving messages to every cell and organ in our body. Like any communication network the purity of the carrier, our nervous system, effects the speed and clarity of the signal. If the fluid inside of our nerves is laced with traces of chemicals or heavy metals like lead, then the result is a delayed and distorted signal. Many experts now believe that the distortion of these signals may be the root cause of many nervous system disorders like Attention Deficit Disorder, Chronic Fatigue Syndrome, Alzheimer's Disease, anxiety and depression. It has been well documented that the clarity of these signals has a major effect on our ability to deal with stress and our degree of coordination. Considering the vital role that water plays in our brain and nervous system, its quality is possibly the most basic and essential key to healthful longevity. Our energy level is impacted largely by our consumption of water. It has been medically proven that just a 5% drop in body fluids will cause a 25 to 30% loss of energy in most people, a 15% drop causes death! It is also estimated that more than 2/3 of all people do not drink enough water and suffer some degree of dehydration. The result being a large part of our population operating at only 70 to 75% of their capacity, or less. Unfortunately most people turn to stimulants like caffeine and sugar to boost their energy level rather than drinking more water, which is what our body needs to produce natural energy. Caffeine, alcohol and sugar are all strong diuretics and actually cause your body to lose water, resulting in a further loss of natural energy production and eventually can lead to a dependency on artificial energy. A large part of our bodys energy comes from a compound called ATP, Adenosine-Tri-Phosphate, which is produced during the osmotic flow of water through the cell membrane to generate hydroelectric energy. ATP is then stored in energy pools and used as chemical energy in our body. The mineral content of our body fluids and the absence of contaminants create the proper environment for this natural energy production. Our body in reality is a complex Hydro Generator, using the elements of nature to become the miracle machine we were intended to be. The purity of the water we drink greatly impacts our strength and energy level. Any time a toxic chemical (chlorine included) gets inside our body we must then use up some of our strength and energy to reduce and repair the damage done by that contaminant. Water is also what our liver uses to metabolize fat into usable energy. Drinking an abundance of clean chemical free water speeds up our metabolism and allows our body to assimilate nutrients better, resulting in increased strength and energy. Our bodys detoxification system is probably the single most important component to optimum health, and the one process that relies most heavily on an excess intake of clean water. We have all heard it said that we should drink a minimum of 8 glasses of water each day. Drinking the minimum will only help maintain a minimum level of health. Our body will use at least 8 glasses of water each day under normal relatively passive activity to maintain the basic bodily functions such as digestion, temperature control, joint lubrication and skin hydration. Each time we exhale, blink our eyes or make any kind of movement at all we use up some of the available water in our system. Even the constant beating of our heart is a water consuming process. We're continuously depleting the available water level in side our body. In order for our body to properly perform the essential task of filtering and flushing out toxins we must consume a level of water above the minimum. The more of an excess that exists, the more our body is able to rid itself of the elements that promote disease and aging. It is a beautifully simple process that can make a tremendous difference in the degree of health we achieve and maintain, but we have to let it happen by consuming an abundance of clean, healthy water! A healthy recommendation for water consumption would be at least 10-12 glasses each day, with optimum benefits reached at 14 to 16 glasses a day. (Caffeinated or sweetened beverages should not be counted towards your daily water intake as they actually cause the body to excrete water.) It is possibly the best health enhancement habit you can develop and it is so simple a glass of water every one to two hours. Try it…drink at least 10 glasses of water every day for just one week and you will be amazed at how much better you feel! Equally important to proper detoxification as quantity is quality. If we consume water that already contains traces of harsh chemicals, like chlorine or any of the other 2100 different synthetic chemicals that have already been detected in our water supplies, then that water does not have the same ability to pick up and carry out chemical contaminants from our body. Water that is free from contaminants can take on and transport out of our body toxins that find their way into our system through other means. We are constantly exposed to and ingest a wide variety of harmful chemicals. Every thing from the foods we eat which contain artificial preservatives, colors and pesticide residue to the clothes we wear which harbor traces of laundry and dry cleaning chemicals that are absorbed through our skin, all expose us to toxins. The air we breathe and virtually everything we touch contains potentially harmful chemicals that are taken in by our body. It is difficult if not impossible to maintain the purity of the air we breathe, the things we touch and the foods we eat, which only makes the purity of our water even more important. Our water quality is the only part of our personal environment that we can easily obtain total control over. With an abundant intake of clean healthy water we allow our body to perform all the healing processes it is naturally capable of. In this age of fast food, synthetic medicines and complex lifestyles we tend to over look the obvious. Our body is a water machine, performing millions of life giving tasks with each passing second, and in each of these synchronized miracles there is one primary ingredient…WATER! A study of the human body can only lead to an overwhelming appreciation and respect for its creator. Keeping our body clean on the inside is not only essential to good health, but an action of appreciation for such a wondrous gift, LIFE!